Ever wonder what happens to perfectly good leftover paint? Nearly half the latex paint we receive we recycle into Local Color Paint. The rest is recycled elsewhere or disposed of responsibly. That’s one way CSWD is working to manage the future’s problems – today. Out of the thousands of gallons brought to the CSWD Environmental Depot each year, our expert staff hand-select the highest quality latex paints for recycling into Local Color. After being sorted by color, each small batch is double-filtered for premium quality and blended to a consistent, silky-smooth low sheen finish. I love how thick Local Color paint is for one-coat coverage! Local Color is known for its long-lasting thickness. It can be washed and scrubbed, and often covers in one coat. Go easy on your wallet! Local Color costs about half as much as new paint – as low as $11 per gallon! 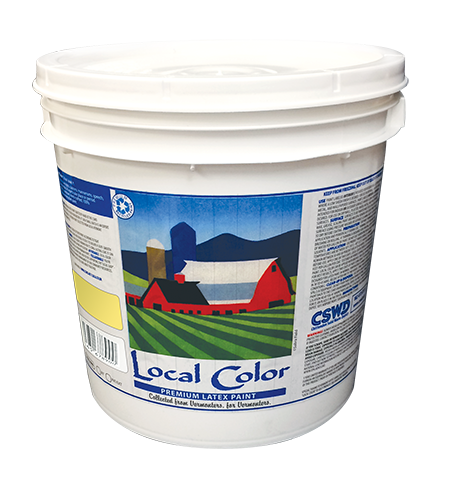 By buying Local Color, you are not only giving your walls a fresh new look, you are also supporting the “local loop” – the responsible & sustainable management of our community resources, here at home in Chittenden County. That’s something we can all feel good about together. Local Color is available in over 30 shades of the following colors. Note: The variety of colors that come in daily for recycling allows us to blend a spectrum of colors instead of just one shade. It can vary between batches, so be sure to purchase enough for your job and subsequent touch-ups if required. Keep perfectly good paint out of the landfill! 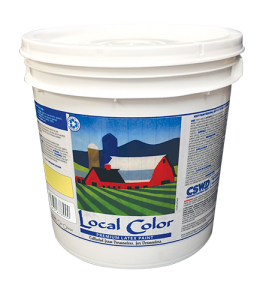 Local Color is available at various retailers around Central & Northern Vermont. See sidebar for more details. If you need to match your new color to a previous paint that you used, you’ll need to have a paint made from the same batch as your last job. 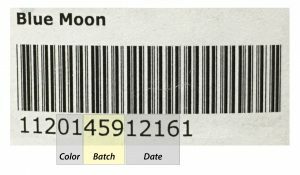 The batch number can be found on the middle three numbers of the barcode on your paint can (see the image on the right for an example). Bring it to the CSWD Environmental Depot for free! We’re an approved PaintCare drop-off location – but we also take a lot of paint and hazardous materials that PaintCare doesn’t cover!